Photo Editor Manager Cynthia Zemlicka today shares the blog post you all know you wanted to: LOC cats! It looks like I have case of the Mondays. What else can I do but share images of cats from the Library of Congress for today’s blog post. This photo is titled “Silvester child with Buzzer the cat, portrait photograph.” It is by the amazing Arnold Genthe. This one is just good fun. 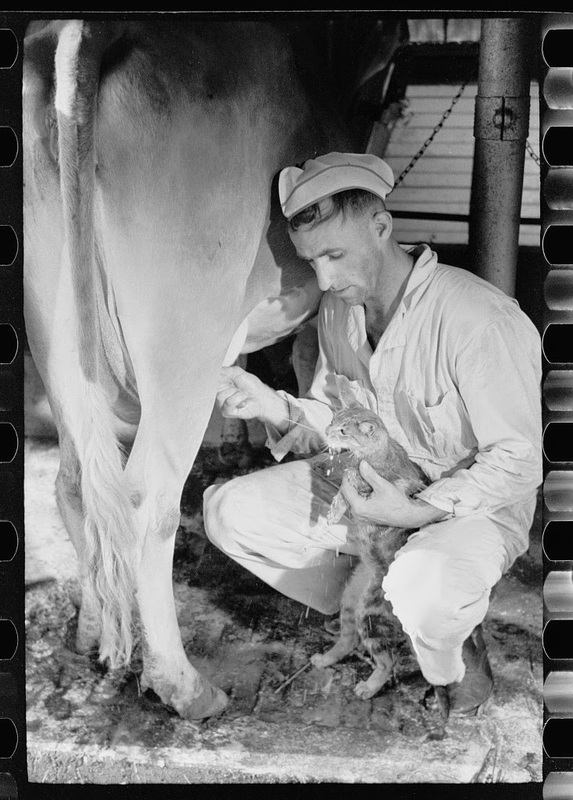 “Milker gives milk direct from cow, Brandtjen Dairy Farm, Dakota County, Minnesota” by Arthur Rothstein. I’m not sure what is happening here, but I like it. It is called “Child in a boot” and it was created by Clay, Cosack and Co in 1871. “Curious Tom. Washington, D.C., Dec. 23. Curiosity killed the cat but Tom, favorite pet at the Washington pound, seems willing to take a chance as he inspects the cameraman’s little black box. Stray cats and dogs at the pound were given a Christmas party today by the poundmaster, Frank B. Marks.” Photo by Harris & Ewing.